- 108. Ear Bugs - 107. Meet the Marmots - 106. File - 105. Incognito - 104. Awful Dangerous? - 103. 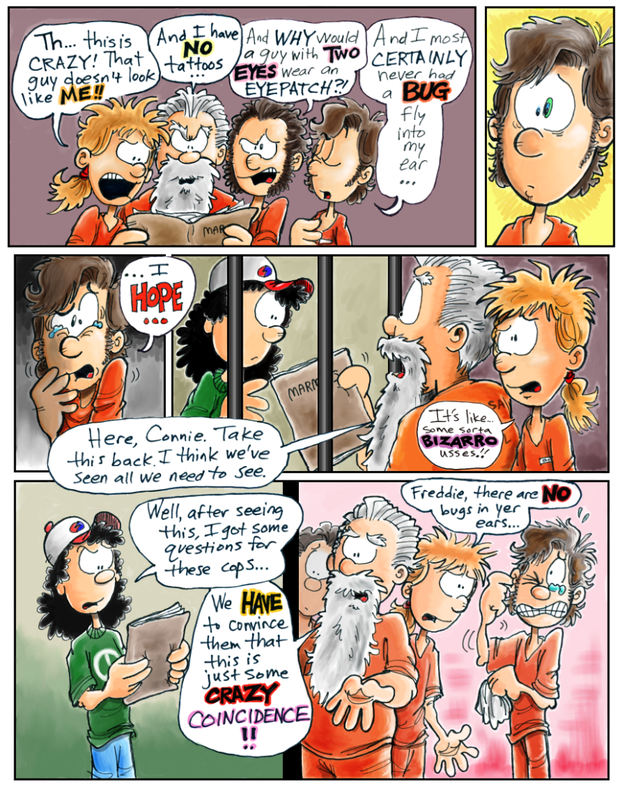 The Mad Marmots - 102. From the Newspaper - 101. Dang Nervous - 100. To the Jailhouse - 99. Saw it in a Movie - 98. Lud Has a Plan - 97. Jail - 96. Note - 95. Strike Out on Our Own - 94. Conference - 93. Meltdown - 92. Dilemma - 91. Job Offer - 90. Concert - 89. Music Soothes the Savage Beast - 88. Leave 'em Alone for Five Minutes - 87. Withdrawal - 86. Who'll go First - 85. Piano Fight - 84. Stampede - 83. Piano Bar - 82. Back on the Road - 81. Connie Knows What to Do - 80. Oh yeah We're Outta Gas Too... - 79. Felix Meets the Milksnake - 78. Only a Milksnake - 77. Kill? Snake? - 76. Snake - 75. Make Water - 74. Outta Gas. - 73. Lost Again - 72. Semi - 71. Lanes - 70. Joe's Lead Foot - 69. Instruction Manual - 68. What "R" Means - 67. Drive - 66. Vote - 65. Who's Gonna Drive? - 64. She's Not There - 63. Jump - 62. PTUI - 61. Spit - 60. Canyon - 59. On the Road Again - 58. *PLUCK* OW! *PLUCK* OW! *PLUCK* OW! - 57. Cactus - 56. Drunk Kiss - 55. Thalers for Bucks - 54. Scratch - 53. Mmm, Steak. - 52. You Totally Threw Felix in the Garbage Dude - 51. Dumpster Dive - 50. DOOOOIIIIINNNNNKKK - 49. Before The Crash - 48. Something's Wrong With Wolfie - 47. Connie is About to Lose it - 46. Bad Feeling - 45. Wolfie Rocks Out - 44. Shiner - 43. Lud is Honest - 42. F-Dawg, the Charmer - 41. Peddlin' The Goodz - 40. Puttin' the Boyz to Work - 39. Financial Difficulties - 38. Acclimatin' - 37. The 21st Century is Noisy - 36. Buy NOW! - 35. New Threads - 34. Wonders of the 21st Century - 33. Shoppin' - 32. Dollar Holler - 31. Head Explosion - 30. Hey, Connie?? - 29. Seatbelts? - 28. 21st Century 101 - 27. HURRRRRRRL - 26. Montezuma's Revenge? - 25. 14 Beers - 24. Weirdest Tasting Beer - 23. Glug - 22. Fried Liver Balls - 21. Thalers and Zlotys. Far Out! - 20. Epiphany - 19. Who's Dead? - 18. Connie - 17. Angry Honking Woman - 16. Joe Freaks Out - 15. WHOOSH - 14. Getting Closer - 13. Civilization? - 12. Shoulda Climbed up the Other Side - 11. At the Top - 10. Climbin' - 9. Shirtless - 8. Scary Restroom - 7. Freddie Wakes Up - 6. Shiny Flying Object - 5. Different Planet - 4. Nesting Material - 3. Wig Toss - 2. Freddie Can't Hack It - 1. The Story Begins - Meet the Compozerz! lately, and the story is about to pick up again. I feel so un-slacker-ish! Note: my navigation buttons are screwed up, no idea why, so sorry about that. I can’t figure it out. My pages on here are all screwed up now, the backgrounds are gone too. I'm giving up on DD all together. I've had it with this glitchy site. I hate to go, but I have found a better, more reliable place to post my comics.